Octopus (hunting) take 5, originally uploaded by Joseph Wu Origami. 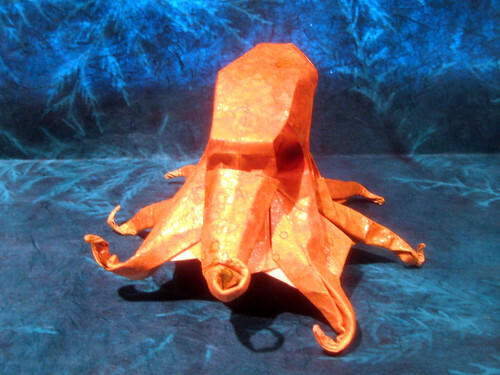 If anyone has a paper anniversary coming up, such as a year of blogging or a year since a creationist promised to “get back to you” about their debunked claim, one of Joseph Wu’s origami octopods might be the perfect gift—to themselves. As long as you’re not out Lying for Jesus, I don’t really care. It’s the people who misrepresent the evidence and distort the theory who drive me crazy. Definitely the perfect gift, then. Sounds like you don’t like people attacking your religion. Well, no. Science is an attitude of questioning and of deep respect for honest and the truth. It involves a continual search for better answers. I respect people who are honestly searching, whether or not they agree. I feel that you would be happier to have your beliefs described accurately whether or not the describer agrees with you. For example, if a large part of public discourse consisted of, “You can never trust a Christian because they worship donkeys on sticks,” you would get pretty tired of having people yell, “Where’s your donkey! ?” would you not? And you would get tired of explaining that the donkey was an incidental part of the story. And that Christ never turned donkeys into wine (“so we can’t believe that religion”) and so on. Or, “If you’re a Christian, why can’t your kids turn wine into donkeys?” I assure you that most creationist descriptions of evolution are a lot further from the mark than my examples. Certainly. My background is in science. I am trained in the scientific method and in critical thinking. It is that training that allows me to see your prejudice for what it is. No, I do not agree with you. But neither do I use inflammatory rhetoric to attack your beliefs. I only have this one post and your comments to go by, since I have not read the rest of your blog. But judging from the tone you have taken here, nothing I can say is likely to pierce the armour of your biases, so I won’t bother trying. I leave you to your anger and your religious need to lash out at those who don’t agree with you. I think you’re projecting. What you are hearing is not anger but frustration at having been hatefully attacked–a lot.